http://ThemisAthena.booklikes.com Themis-Athena's Garden of Books 0.0 Halloween Bingo 2017: Update 7 -- Bingos No. 3 & 4! text Halloween Bingo 2017: Update 7 -- Bingos No. 3 & 4! 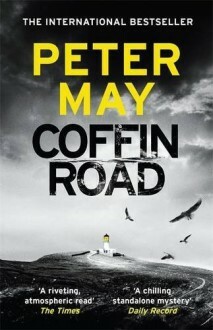 http://mikefinn.booklikes.com Mike Finn 5.0 "Coffin Road" by Peter May - beautifully written, atmospheric thriller. text "Coffin Road" by Peter May - beautifully written, atmospheric thriller.